Joe and I made the drive from New York to South Florida, and in 24 hours, we experienced three seasons. We began our journey in winter and then arrived in spring by the time we reached South Carolina. Once in Florida, it was all-out summer. This trip is why I didn’t start any seeds in February. There would be no one to take care of my seedling babies during the final week of March. Needless to say, I missed working in the potting shed and watching geraniums and impatiens and petunias make their debut onto the world stage. It’s the main reason why I’m taking this walk down memory lane, a repost of last year’s seed starting experience and a chance to reminisce. By the way, seeds will be started when I return to Long Island: zinnias, sunflowers, cosmos — seeds that like to be sown where they’ll grow. Now that I read that sentence, I like to think of myself in the same way. I like to be planted where I can grow. The thing about a vacation is that you have to come home. One day, I was enjoying the warmth of south Florida sun, and the next I was bundled up against the wind chill on Long Island — and there’s no better day to start seeds. 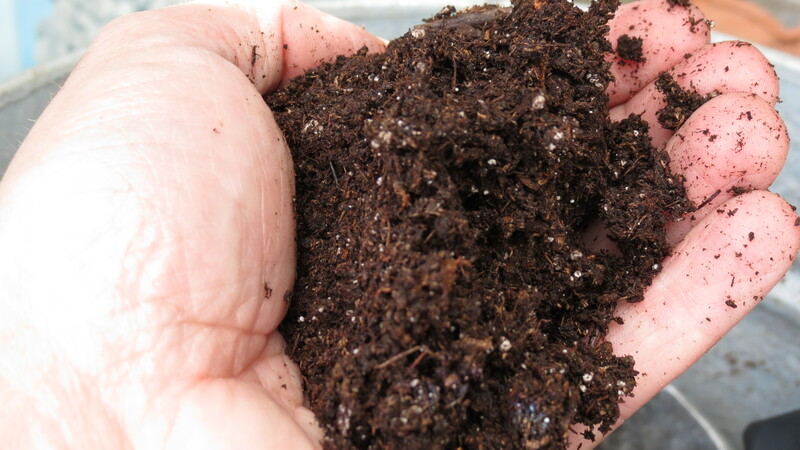 Like many of you, my hands were itching to get dirty and to begin the new growing season. Since the potting shed was built, this has been my tradition — a step-by-step homecoming. 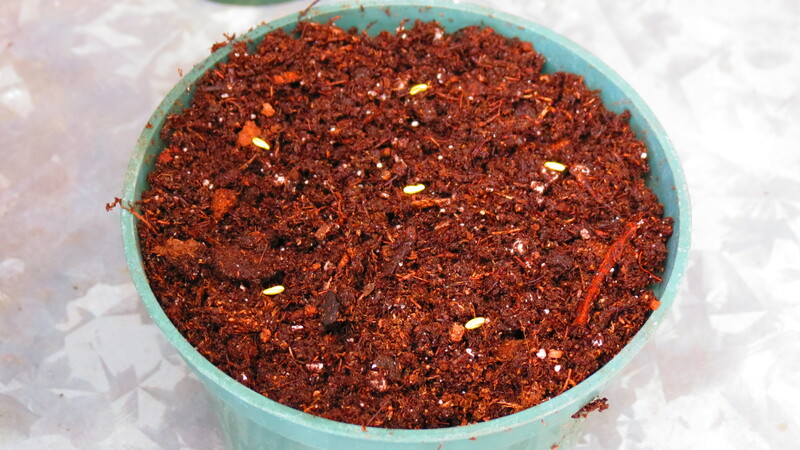 Step 1: I start with a pre-mixed bag of seed starting mix — mostly out of laziness and lack of space and time. I dump it into a pail and add warm water — to make my hands happy as I mix it all together. Step 2: I don’t want to make it soggy — but moist enough that it will hold together. The moisture not only helps the seeds to get started, but it also eases the amount of dust from the seed starting mix. 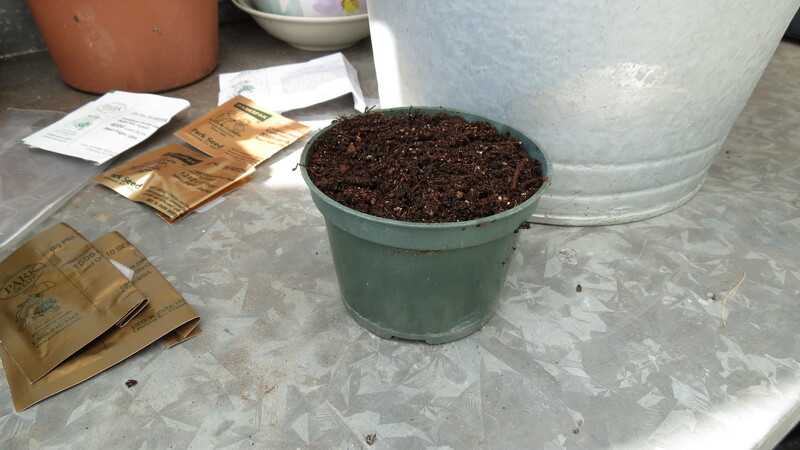 Step 3: Then, soil is added to a smaller pot. I do not tamp down this soil. I want to keep it airy so that the newly forming roots will be able to grow without having to battle compressed soil. 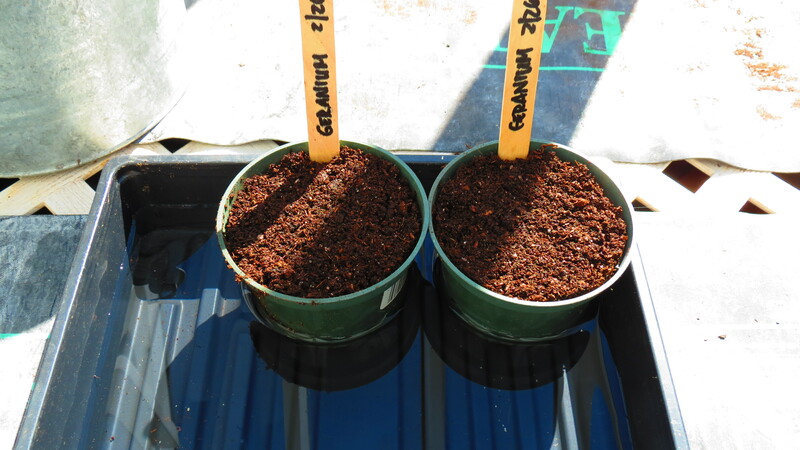 Step 4: Geranium seeds are planted here. 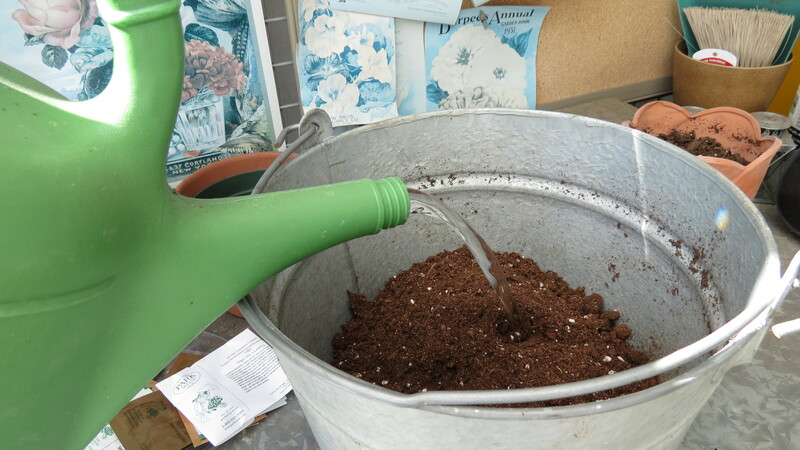 I place several seeds in one pot and then cover them lightly. Once the seeds sprout and have their first set of true leaves, they will be moved to individual pots. Step 5: Now planted and labeled, each pot is placed in a tray of water so they can be watered from the bottom — again to prevent soil compression. Also, I keep water in the tray and keep the tray on the heating mat in an attempt to create some humidity. I’m not sure if it really works — but I like to think that it does. 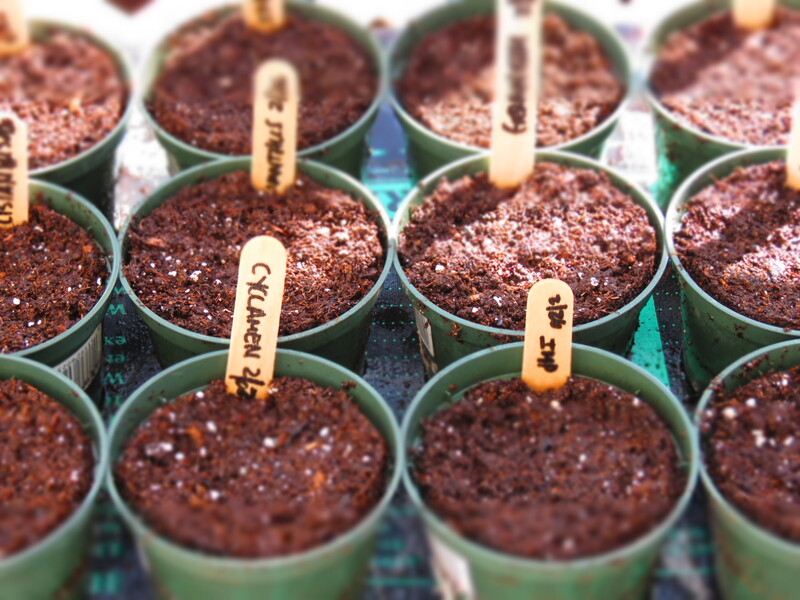 Step 6: After soaking up some water, the potted seeds are placed on a heating mat so the soil can receive even warmth. At this stage, the seeds do not need sunlight — they’re underground. They do, however, need heat to help with germination. Once sprouted, then sunlight will play a role. Since this is my first seed starting season with a blog, I thought I would create a page of regular updates. If you’d like check in on the seeds, please visit the new page tab above, “The Seed Monologues.” Here, I will keep brief notes on the seeds that are planted and what’s happening in the pots. In the meantime, best of luck with all of your seed starting endeavors. I’m still here in South Florida — and everything is green and warm. Tonight, though, the locals are quite cold — temperatures are in the low 50s. I’m wearing shorts and a sweatshirt, and I feel fine. 🙂 I do miss the seeds and I’m hoping the weather up north warms up a bit for my return. I have to get the yard in order. Do you think your bird can help me out? Stay warm and I hope you’re feeling well. Creem Cheez has planted many seeds in the garden. Sunflowers are his specialty. Thank you for sharing. Propagating from seed for me is harder than it should be. I can use any encouragement, information, or just humor to help me make this process work. Hi Charlie. Seed propagation is my most favorite thing about gardening. I’m constantly amazed at what is locked up in a seed. 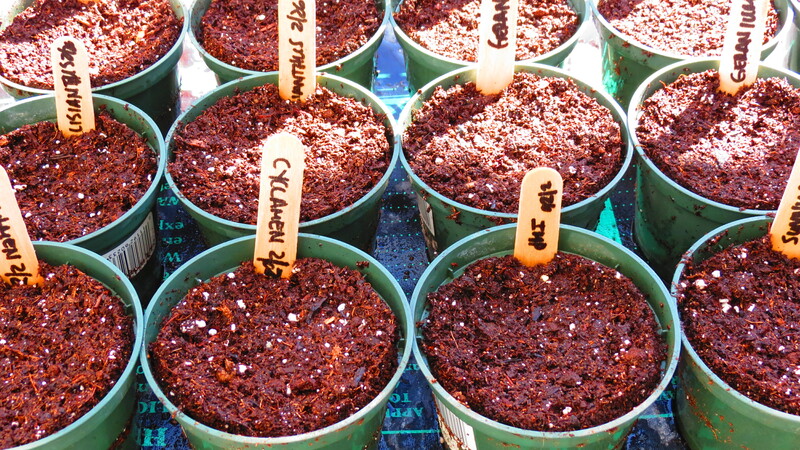 Before the potting shed, I played with easy seeds, like sunflower and zinnia. They can be sown outside after the soil warms up. I then tried the dining room table method with mixed — and leggy — results. The potting shed allowed me to try more challenging seeds. In the end, though, seeds like warmth. Once leaves appear, sun becomes a factor. Give the easy seeds a try. The most you’ll lose is a few dollars. The gains are far greater. How I whish I was in Florida too !!! Do they ever get frost and snow in Florida ? Actually . . . A few years ago, we woke up in the morning and found ice on the windshield of the car! Frost can be a major issue in this state, especially for the citrus growers. I guess winter’s icy grip can travel south. Hope it warms up for you soon, Gwennie! I struggle with starting seeds in my southern window. Too wet, too dry…it seems like I’m always neglecting them or coddling them to death. I am fortunate that my aunt has a nice warm porch and that she is brilliant at it. I depend on her for my tomato, eggplant and pepper starts. Everything else, I sow directly into the garden where the plants grow tough enough to survive my carelessness. Thank you! Hi Cindy. Starting seeds in the house can be difficult. I used to start them on top of the refrigerator, where it was the warmest. The problem came after the seeds sprouted. There was only so many windows and the dining room table became my potting bench. 🙂 It’s good to have a relative with a warm, sunny porch. Happy gardening! Hi Debra. Wow! Welcome to the flower club. 🙂 I have always steered away from vegetables — a lot of work and it’s either feast or famine. I’ll stick with flowers. And have you listened to Margaret’s podcast? It’s available through the iTunes store. Very informative and relaxing. Hey birthday girrl. 🙂 There’s nothing wrong with being lazy when it comes for plants or seeds. Instant gardens can be just as fun — as long as you get dirty in the process. Hopefully winter is over or as we say in Bahston, Ovah. Looks like you are on your way there. I have a few seeds starting to sprout now. I was late this year starting but it felt so good to think about things growing again. Have a lovely week and enjoy that sun. Lona, it’s so nice to see green down here in Florida. I’m hoping that when I return to Long Island, some more green will be making its appearance. Happy gardening! Hi Helene. I can hear the desperation and chill in your words. I’m not sure if this is the coldest winter in my part of the world, but we have certainly had our share of battering. Hurricane. Blizzard. Nor’easters. Cold. Yes, it’s time for all of us to get outside and to get dirty. If only Mother Nature would ease up. Warmer days are coming!